About 80 baptisms or christenings are celebrated each year at All Saints Fulham. Most of these take place after the 11.30 Family Service on Sundays, when the toddler or baby being baptised is welcomed as the newest member of the congregation. In accordance with Church of England practice, anyone who lives in the parish or who is, or intends to become, a regular worshipper is welcome for baptism, regardless of age. 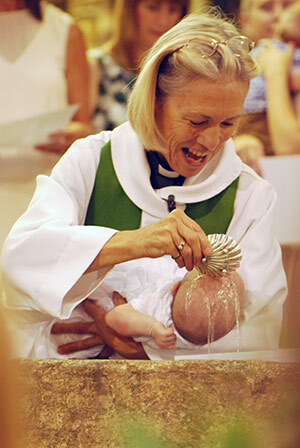 Baptism marks the start of a lifelong journey of faith, which parents and godparents promise to support. The service also provides a wonderful opportunity to welcome and thank God for the miracle of love that leads to new birth. At All Saints Fulham, preparation for baptism is led by parents who have had their own children baptised at the church. They will answer any questions you might have over a glass of wine with other families who are bringing children for baptism at roughly the same time as you. You will also be visited beforehand by a baptism visitor who will play a part in the service, and help you feel at home when you come to church. If you would like to book a baptism please call the Parish Office at Pryor's Bank on 0207 736 3264 and make an appointment to speak to one of the clergy. We encourage you to come along to the 11.30 service for a few Sundays before making a booking, to get a flavour of the church. Please bear in mind that we are unlikely to be able to do a baptism at short notice because most Sundays get booked up some time in advance, but we do our best to find dates that will work for everyone. For further information, please take a look at our Baptism Pack.